DIY popsicles—no fancy mold required! Homemade popsicles are a great way to cool off your kiddos when it's hot outside. You can find an endless array of popsicle recipes online or in recipe books like Perfect Pops or People's Pops that only require fruit, juice and a few other ingredients you probably have on hand. And while you could spend up to $20 on adorable popsicle molds like Tovolo Star Ice Pop Molds, Cuisipro Sailboat Popsicle Molds or Dino Popsicle Molds, with a little creativity you can make your own molds. Of course, you can always pour your puree into Dixie Cups, but we found six more seriously creative ways to make homemade popsicles without store-bought molds. Ice Cube Trays: Sure, store-bought popsicle molds are cute, but most of them make gargantuan sized popsicles that are far too big for little kids. That's why we think an ice cube tray makes perfect pops for toddlers. Make your popsicle mix, pour into the ice cube tray, add popsicle sticks and freeze. Bigger kids will love helping themselves to two or three, while younger kids will be happy with one petite pop. No ice cube tray? An old Styrofoam egg carton will do the trick, too. 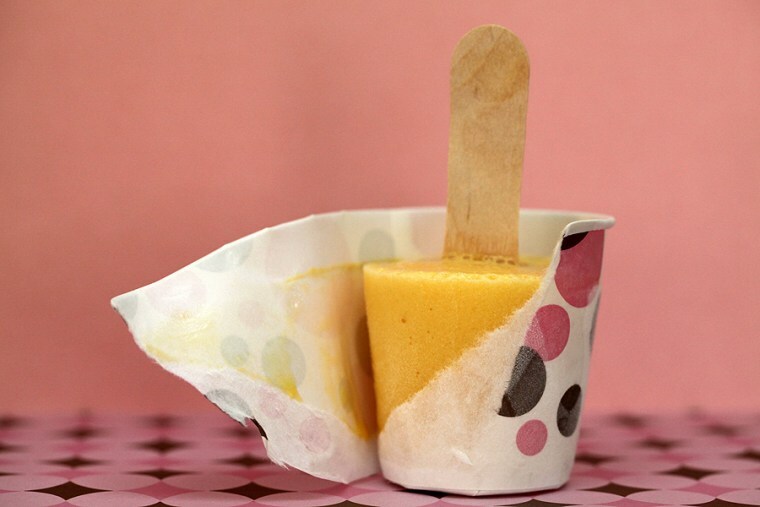 Paper Candy Cups: Another simple way to make smaller popsicles is to use paper candy cups. They're inexpensive to buy at the grocery store or local baking supply shop, and kids will like the process of pulling the paper away from their pop as they eat it. Bread Pan: Make an entire loaf of homemade popsicles using a bread pan. First line your pan with plastic wrap, then pour your mixture in. Cover with 2 or 3 layers of plastic wrap. Next, make tiny cuts in the wrap where you want your popsicle sticks to go and insert them. Once frozen, run the pan under warm water to loosen the edges. Lift the popsicles out of the pan using the plastic wrap, slice the popsicles and enjoy! Plastic Easter Eggs: Still have a few of those colorful, hollow plastic Easter eggs sitting around? Turn them into super-cute popsicle molds! You'll need to punch holes in the bottom to fill the egg with your mixture (a tiny funnel or piping tip will help you do this mess-free). Then stick plastic lollipop sticks in the end before you freeze so your kids will have something to hold onto. When you're ready to eat, simply take the top off the plastic egg. Cordial Glasses: Small glasses, like cordial glasses, work well for making popsicles. Worried that glass isn't kid-friendly? Don't be; They never need to get their hands on the glasses. Once you're ready to eat one of your homemade popsicles, run the glass under hot water for 2-3 seconds, pull the pop out and hand it to your child. Baking Tins: If you have little baking tins for making tarts, mini pies and the like, they'll make lovely shaped popsicles. Pour your popsicle solution into the molds, add wooden popsicle sticks and freeze. Easy-peasy!